Guardian journalist writes that Britain must offer support and security to recently attacked Somaliland. The co-ordinated suicide bomb attacks in Somaliland's capital Hargeisa shattered more than a decade of stability. Yet the despite the continuing threat hanging over this former British protectorate, the British government will not act to properly protect the fledgling democracy. Since tearing itself from a bloody union with the violent southern half of Somalia, Somaliland to the north has been an oasis of democratic hope in a turbulent region (about 8,000 people are estimated to have been killed in southern Somalia in the last 18 months). The car bombings, which killed about 30 people (including two UN officials), served as a bitter reminder to the Somalilanders, if one were needed, of their proximity to the pit of spiralling violence and their own vulnerability of sliding back into it. There were also lethal explosions in the semi-autonomous regime of Puntland. The international community is watching passively as the terror and violence erupt again. There is no shortage of international condemnation for the attacks, including from the minister for Africa , Lord Malloch-Brown, but no real practical help is being offered. As the former colonial power, Britain has a particular responsibility to the 3.5 million Somalilanders. "We need two levels of support," says Abdi Karim, head of Wales Somaliland Communities Link. "First, capacity-building and training of police and security services. Second, humanitarian support for the hospitals, if there are further attacks". Somaliland does not qualify for specific aid and development, let alone additional security support, because it is not recognised as sovereign by the UN. It has been effectively an independent country since 1991, but without diplomatic recognition there can be no support programme; the result is extreme poverty and a chronic lack of defence infrastructure. Michael Walls of Somaliland Focus ( UK ) blames "a lack of willingness on the part of many international actors to sufficiently recognise… both state and civil society remain enormously under-resourced". The bombings in Somaliland were most likely a concerted effort to curtail the country's third presidential election to be held next March ; voter registration has ceased in the ensuing security clampdown. There is a strong suspicion across the region the group responsible for the atrocities was al-Shabaab an extreme Islamist militia which now effectively controls the southern Somali port of Kismayo and parts of the capital, Mogadishu . They practice an extreme form of sharia law and have now turned their spiteful gaze to the harmonious north. They announced their murderous intent in 2006 when one of the leaders of the Islamic Courts Union, Sheikh Dahir Aweys, promised publicly "to send 30 young martyrs to carry out explosions and killing of the Jewish and American collaborators in the northern regions". Al-Shabaab is considered by many governments to be, at least ideologically, if not materially linked to al-Qaida. Since they overran Kismayo in August, al-Shabaab leaders have restored order. But then began the wholesale violent suppression of the people, particularly women, under their perverse interpretation of Islamic law. To gauge the degree of fundamentalism within al-Shabaab, you need look no further than the stoning to death of 13-year old girl in Kismayo. The circumstances of Asha Ibrahim Dhuhulow's killing could hardly be more brutal. She was first raped by three men but was condemned as "an adulterer" by Al-Shabaab leaders. An anonymous eyewitness told the BBC she was dragged to a stadium weeping. She was buried up to her neck before 50 men stoned her in front of a 1,000 strong crowd. The international community seems resigned to this institutionalised barbarism and routine human rights abuses in Somalia. But there has been some hint from the British government they would like to help Somaliland but are held back by the "technicality' of not having recognised sovereignty - notably by, chair of the All-Party Group for Somaliland Alun Michael MP, Britain's support would risk offending the sensibilities of Italy and a couple of African Union countries which oppose their independence. But the counter-argument to an independent Somaliland can be captured in one word: "Somaliweyn'. 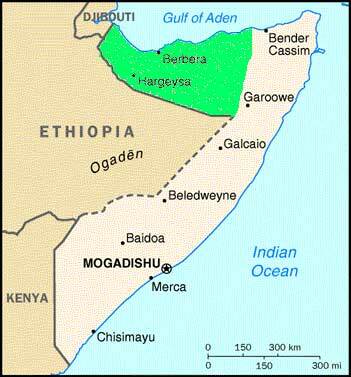 In essence it means a call for a Greater Somalia by uniting all the Somali peoples who currently live in southern Somalia , Somaliland , Djibouti , eastern Ethiopia and the north-eastern province of Kenya . Somaliweyn is nothing more than chauvinistic patriotism which defies long-established international boundaries and flies in the face of political reality. Reports from Hargeisa in recent days describe a tense city still in shock and fearful of the next strike from al-Shabaab. It is time Britain acted to offer effective security support and intelligence to Somaliland.